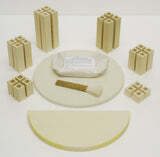 The Evenheat RM II 1413 ceramic kiln is designed specifically for the home ceramic artist. With interior dimensions of 14.5" diameter x 13.5" deep for a 1.3 cubic foot volume, the size is perfect for smaller-size work. The HF 1413 is constructed of American-made 2-1/2" firebrick throughout to allow for cone 8 work with greater efficiency and temperature distribution. Choose from either the Rampmaster II or Set-Pro controls for the most accurate and consistent firings. The RM II 1413 ceramic kiln comes with a free 2 year warranty. The Genesis is another touch screen option; while not as packed full of features as the TAP Smart Controller - it has great flexibility over the Set-Pro! The Genesis has the ability to store up to 12 different programs - with up to 32 segments per program each! You'll have trouble adding segments, skipping, or adding temperature along the way. This is a great choice for a controller if you want the features of a smart controller, but want the ease of straightforward programming and use. Four (4) each of 1", 2", 3", 4", 5" and 6" Posts. All posts 1" square. They helped us on the phone before and after. Good people. I'm a teacher and I fire most days , it's large enough for 5 or 6 items , and small enough for 1 , I did not notice any chance in the electric bill. it ran for hrs and never got to the right temperature, so l called and talked to your tech. After a long conversation he said I wasn't getting the right amount of electricity, so after calling in a electrician and having the house current fixed it runs great!